Lake Tohopekaliga is part of the Kissimmee chain of lakes. Boasting superb largemouth fishing, the lake has largemouth record of 17 lb -12 oz. Lake Tohopekaliga consistently yields good catches of panfish, black crappie, bluegill, redear sunfish and catfish. Florida's lake Tohopekaliga large mouth fishing is rated and reported as one of the top areas in the USA. Largemouth bass are found in nearly every freshwater impoundments in Florida. More then 7,500 freshwater lakes and rivers are available for fishing freshwater in Florida. Fishermen face a tough decision on which lake to chose because they all hold good populations of largemouth bass. Lake Toho is located next to the City of Kissimmee in central Florida. It is the second largest lake in the Kissimmee Chain of Lakes and represents the second largest water body on the Kissimmee Chain of Lakes. It is noted to be one of the premier largemouth bass fishing destinations in the USA. Many professional and amateur fishing tournaments are held here every year. The following Lake Tohopekaliga fishing report identifies areas around the lake that have been known to hold largemouth bass. Area #1 Lily pads, Land bulrushes along the north shore of Fells Cove hold numbers of bass in the cooler months. Fish plastic worms along vegetation in 4-to 6-foot depths. Area #2 The mouth of Lake Ajay canal produces when water is flowing after spring or summer rains. Schools of bass and bullhead catfish are drawn to the flowing water and respond to live baits or artificials. Fishing with cut bait or 4-to 6-inch shiners is a proven technique for giant catfish. Area #3 Bass anglers fishing with live bait are often successful along the southeast side of Fells Cove. To catch a large bass in spring or summer, anchor near the cattails or slow-troll the weedline with an electric motor. Troll from the Fells Cove cut to Lake Ajay canal, keeping the shiners 20 feet behind the boat and near the surface weedline. Area #4 Bass and bluegill are taken from the first 30 yards of weeds extending along the cut from the Fells Cove mouth. If it's windy, fish the entire canal all the way to the main lake. Cast topwater plugs and minnow-type lures around the grass for bass. Area #5 The Fells Cove canal entrance holds bass year-around. Bass anglers throw lipless crankbaits into the open water or plastic worms to the weedline. Fish the area when there is a current coming into the lake and continue on into the canal for 25 to 50 yards when the bass are actively feeding. Some large catfish have been taken from this canal mouth accidentally on artificials, but cut bait is preferred by catfishermen. Fish when runoff from a rain generates a current. Area #6 The deep hole off the Boy Scout camp is known for holding bass. Troll live shiners 30 yards behind the boat or spray cast a crankbait around the drop-off. Silver/black is a popular color for schooling bass in summer. The fish hold on the dropoff which slopes from 6 feet on the edge of the hole to 16 feet at the bottom. Fish live shiners close to the bottom. Use weedless plastics to fish the bulrush. Area #7 This area of scattered bulrushes and grass patches holds bass year around. It is a prime wading area; some anglers hop in and tow their boat behind them with a line around their waist. Cast white and gold-bladed spinnerbaits. Plastic worms and lizards are effective in the 3-to 4-foot depths. Slowly crawl Texas-rigged plastics with 3/16-to 1/4-ounce slip sinkers through the weedline in the cooler months. Area #8 Grass patches along the east side hold bass all year. Also work the boat cuts through and behind the densest cover in spring and fall. 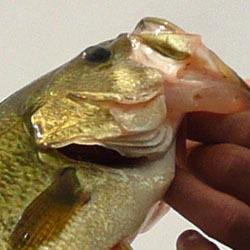 Weedless spoons, plastic worms and jerkbaits are effective in the open pockets. 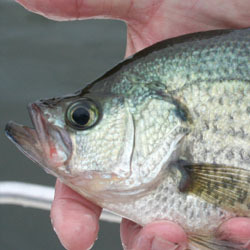 Panfishermen can catch bluegill in the summer and crappie in January and February. Area #9 Bass can be caught throughout the entire length of the Lake Runnymede Canal. Fishing is best in late spring and early fall. Work jerkbaits, topwater plugs and vibrating lures around the masses of hydrilla along the banks. Texas-rigged plastic worms are effective when fished in and over the hydrilla. Area #10 Buzzbaits and spinnerbaits take bass from the open water around the hydrilla on the southwest side of Runnymede Lake. Fish all the pockets and cuts through the vegetation in the spring and fall. At night, crawl dark plastic worms in the same pockets. Black and purple are proven colors. Well I hope the 10 areas identified in this Florida lake Tohopekaliga fishing report will help on you plan your next freshwater fishing trip to Florida. Each detailed map provides depth, contours, structure, boat ramps, and updated fishing information. 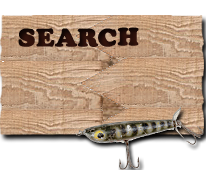 Lake Tohopekaliga fishing maps also include lake info such as gamefish abundance, forage base, water clarity, weedline depth, bottom composition, complete latitude/longitude grid lines and dozens of GPS waypoints & coordinates.